It’s my first time in Vancouver, and already I’m in love with the place. Everything is just so clean, and beautiful. The people on the streets all seem to be young, well dressed, slim and healthy, and overall look extremely pleased with the general state of things. The weather is a balmy 27’C and the sun is out until 10pm, which means downtown is all aglow with that happy feeling of summer. The sidewalk cafes are full of smiling, laughing well-to-do Asian students, and restaurants of every cuisine line the streets. At the lovely parks, fountains gush and the flowers bloom, while young mothers in pretty dresses and strappy shoes laugh and play with their kids. All along the waterfront people are hanging out, setting up picnic blankets, strumming guitars, smoking joints, and playing volleyball. Families go by on bicycles, and rollerbladers zoom along with a dog trotting on a leash. Cute little bathtub-shaped ferries shuttle people across the bay, and all the guys who drive the ferries are young, cute, and seem to be enjoying their jobs. At Granville Island, the market is bustling with fresh local produce, and outside a variety of musicians play their tunes and accept toonies as tips. We sit and have a delicious locally brewed draft beer by the marina where ridiculously energetic waitresses advise us on what kind of beer we might like. It helps that it’s Canada Day, and people are feeling patriotic and proud. Someone hands a little Canadian flag to our daughter to wave. If I didn’t know any better, it was like landing in a tourism board advertisement for Visit Vancouver. Now I know why the far away west coast of Canada is almost like a completely different country altogether. I went to university in Toronto, and can’t say that I found it to be anywhere near the utopia that Vancouver presents itself as. Vancouver is considered by many to be the best place to live in Canada — a place where the weather is mild, snow is minimum, and the people are friendly, and helpful, and chatty and hip and liberal (and often stoned in public). Sounds good to me! We stayed at the amazing Sandman Suites on Davie, which is on the west side of downtown (and unbeknownst to me at the time of booking in the heart of the gay district). A great location on Davie Street with loads of bars, restaurants and shops, I’d recommend Sandman Suites whole heartedly because you get a kitchenette and a separate bedroom which is perfect if you’re travelling with a kid so you can stay up and chill in the living room while baby is sleeping in the room next door. Plus they’ve got a heated swimming pool which is a nice bonus! The hotel also walking distance to the beautiful Stanley Park, a whopping 1,000 acres of public park land right next to the downtown area. So despite our jet lag, we decided to go spend the day there at the park, but being cheapskates decided against renting the $50 bikes for the day. “We are city people, we know how to walk for hours, no problem!” we said, foolishly. So walk we did. And it was fine until we realised we had walked almost to the furthest point of the park at Lions Gate Bridge, and now were too damn tired to walk back. Thankfully, one of the kind drivers of the hop-on-hop-off buses that tour the park took mercy on us when we asked them what was the best way to get back to the park entrance. Without his kind offer to sneak us onto his tour bus, who knows what we would have done! So my advice, if you don’t want to bike, or if the biking is too expensive and you’re on a shoestring budget, don’t walk further than you can handle! We only have five days in Vancouver, but it doesn’t take long for me to see why half of Hong Kong tries their best to move there. “Vancouver?” someone said to me once, with a dismissive wave of the hand. “That’s a suburb of Hong Kong.” And I don’t blame the rich Chinese for flocking to the city. Not many cities in the world can boast of having the perfect combination of city life and nature side by side. This is why, of course, you need upwards of CAD $800,000 to live there and buy a property, which is also why everyone there exudes an aura of well being and success. Money tends to do that, I suppose. CAD $1 million doesn’t get you a lot in Hong Kong, but you sure could live a sweet life in Vancouver for that kind of cash. 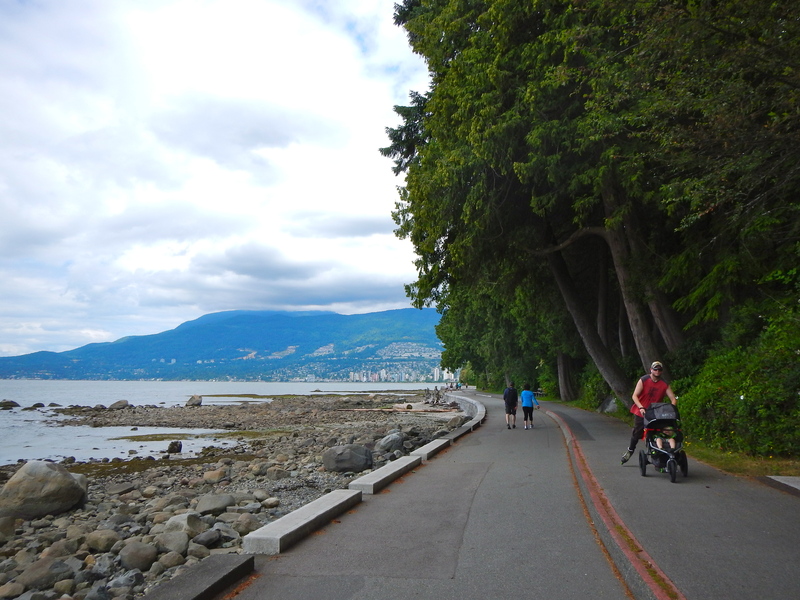 But, Vancouver is not all peaches and cream, as we discover one day while out walking. 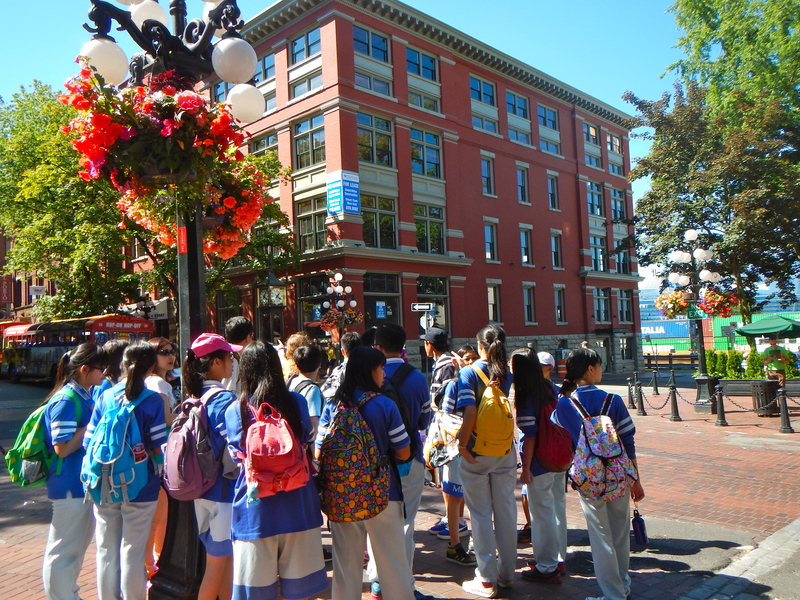 First we ventured to the east side, to Gastown, a quaint old area of the city to walk around in, with cobble stoned streets, cafes, and trendy shops. From Gastown we continued to Chinatown to take a look, and much to my surprise found it to be a kind of dead area. The Toronto Chinatown is a big, vibrant, busy, bustling district, but the Vancouver one didn’t seem to really have any vibe. I suppose all the Chinese immigrants are in Richmond! All in all there is not much to see or do in Chinatown, so I’d suggest skipping it altogether. A minutes walk later we suddenly found ourselves in a dirty, dingy street, surrounded by homeless crackheads doing the methadone shuffle along the sidewalk and lining up for free clinics. We had accidentally walked through East Hastings — the dirty piece of gum stuck on the underside of Vancouver’s shiny new Manolo Blahniks. How do the poor and the addicted survive in the most expensive city in Canada? Coming from Hong Kong, it was quite shocking to see that such a valuable area of prime real estate was essentially much a big ghetto that stinks of piss. It’s not the kind of area you want to find yourself in at night, and even though it was only 4pm we got out of there as quickly as possible. Shh… don’t get too close… they want brains… braaaaains…. Thankfully, the downtown core is quite small, so in no time at all we were out of East Hastings and back in the shiny happy side of the city, watching the sun slowly go down over the kayakers at the aptly named Sunset Beach Park. It was a short trip, and you can’t see that much in just a few days, but Vancouver certainly made a big impression of me. I look around, and everyone looks so content. So relaxed. So healthy. It’s a far cry from the crowded, high-stress, noisy, polluted highrise chaos of Hong Kong. I breathe in the clean, crisp summer air, and imagine how nice it must be to call Vancouver home. Maybe we’ll find a way. Up next — the summer trip continues to the Last Frontier, Alaska.